A relative unknown before joining Dylan in 1991, Jackson had played with Jo-EL Sonnier before allegedly being discovered by Dylan. He also reportedly been in several bands in around Tennesse before joining the tour. Well versed in both rock, blues and country, Jackson�s straight-head style gave the group a direct and aggressive sound. Jackson�s solos and lead work were much more dominating than those who would follow him in the guitar slot. Jackson would also pull out his banjo from time to time as well. According to Clinton Heylin in his "A Life In Stolen Moments," Jackson's skills even caught the eye of Bruce Springsteen when Springsteen came onstage during a Dylan show in New York. 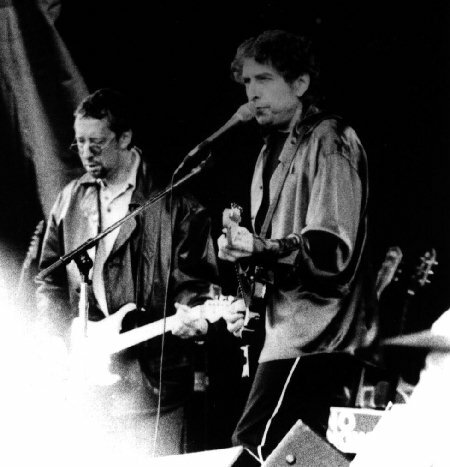 According to organist Al Kooper, when he sat in with the band for the Prince�s Trust concert in the summer of 1996, Jackson would also fill in for Dylan during the sound checks or rehearsals. Kooper said Jackson would sing the songs, often in a voice so similar to Dylan�s, he got stop for autographs afterward. Rumored to have had a rocky relationship with Dylan (though they did tour together for more than five years), Jackson left the group at the end of 1996. He eventually resurfaced as one of the guitarists in Lucinda Willams� road band.